Amid closure of state and central government offices since February three in western Odisha to demand setting up of a permanent high court bench, Chief Minister Naveen Patnaik today urged the Centre to expedite the process of fulfilling the long-standing demand. “In view of the persisting agitation by the people of both western and southern regions, I would urge upon you to engage with Orissa High Court for an early response based on which I am hopeful that a favourable solution can emerge to fulfil the long-pending demand,” Patnaik said in a letter to Union Law Minister Kapil Sibal. Patnaik’s letter came after ministers and MLAs of western Odisha met the chief minister and discussed the ongoing agitation. While all offices remained closed in seven districts of Subarnapur, Sundergarh, Sambalpur, Boudh, Deogarh, Bargarh and Jharsuguda since February three, members of Sambalpur Bar Association launched relay hunger-strike on February five. Patnaik had earlier on September 28, 2013 requested Sibal to take steps on establishment of high court benches in western and southern Odisha to meet the aspiration of the people of these two regions. “I have also conveyed the assurance of the state government for provision of adequate funds and other resources required for establishment of these two benches,” Patnaik said in the letter. Sibal in his reply on October 23 this year informed the state government that the letter had been forwarded to the Chief Justice, Orissa High Court to examine the case. Sibal had also told the state that further action would be taken by the Centre based on the response from the high court. However, the state was yet to know the view of high court on setting up benches in the two region of the state. Meanwhile, the Central Action Committee of western Odisha lawyers said they would examine the state government’s letter before taking any decision on the future course of action on agitation. BHUBANESWAR: Not single nomination was filed for Balangir municipality and Titlagarh notified area council (NAC) for the rescheduled urban local body (ULB) elections on November 22 by close of nominations on Tuesday. Local political leaders cutting across party lines in the two towns backed the lawyers’ poll boycott call in support of high court bench. Elsewhere, however, the parties went ahead by filing nominations. 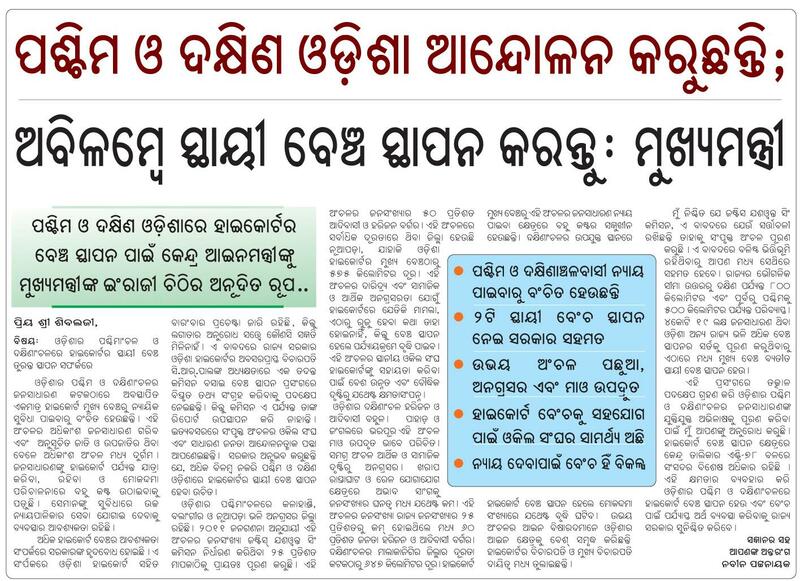 State Election Commissioner Ajit Tripathy said the commission will soon take a decision on Balangir and Titlagarh while polls will be held according to schedule in 20 other ULBs. The State Election Commission, in a statement, said total 1,265 candidates filed papers for polls to the 22 ULBs. Highest 127 candidates filed nomination papers for Brajarajanagar municipality. On the last day, 23 Congress candidates filed their nominations in the industrial town while nominees of other parties had already filed papers. As many as 696 candidates filed papers on Tuesday, which is the highest number of nominations on any given day since the process began on October 28. In Bargarh, all three major political parties filed nomination papers on the last day of nominations while three candidates had filed their papers earlier. As many as 76 candidates filed nominations for the 19-ward Bargarh municipality on Tuesday. In Deogarh, BJD leader and district bar association president Bibhuti Gangadeb resigned from the post after a section of lawyers accused him of extending support to the poll process despite opposition from lawyers. 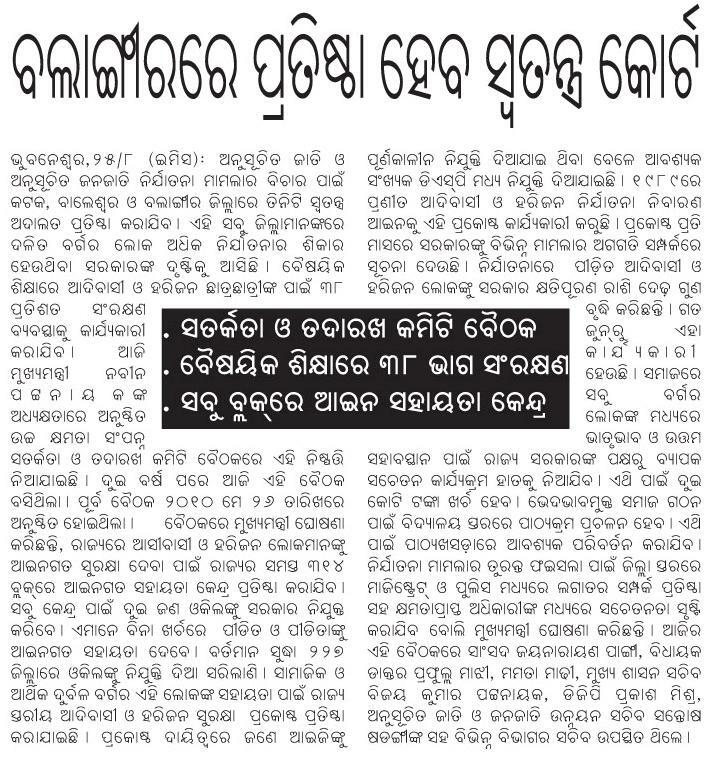 For the 11-ward Deogarh municipality, 53 candidates filed nominations out which 11 each are from the BJD, the BJP and the Congress while 20 are independents. In Bhawanipatna, after 20 BJD aspirants filed nominations on Monday, Congress and BJP nominees too decided to contest the election. Despite protest by lawyers, 50 candidates filed nominations on Tuesday. They include 19 from the Congress, 15 from the BJP and 16 independents. Verification of the papers will be done on Thursday while November 11 is the last date to withdraw nomination papers. While the BJD has decided to take part in the polls, citing that boycott will not help the cause of HC bench, the Congress and the BJP said they were forced to file papers as others did. “We were left with no option as BJD candidates filed papers,” said Odisha Pradesh Congress Committee president Jayadev Jena. The BJP said its party candidates may withdraw nominations if Congress and BJD nominees do so. “We are ready to withdraw the nominations if both BJD and Congress take similar decisions,” BJP spokesperson Suresh Pujari said.